I've been doing some research on the best fruits to grow in containers. It's tough in my region, unless you have a heated sunroom in which to overwinter them, to grow things like citrus. It's a darned shame. How I would love to be able to walk out my door and pick some fresh lemons for my iced tea. Or limes for my raspberry gin. 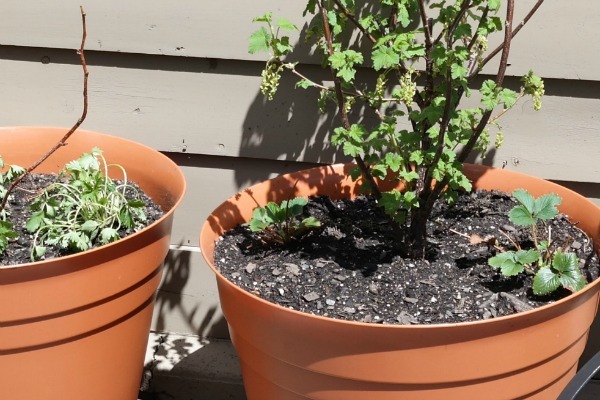 However, there are other fruits that can grow quite happily in containers. 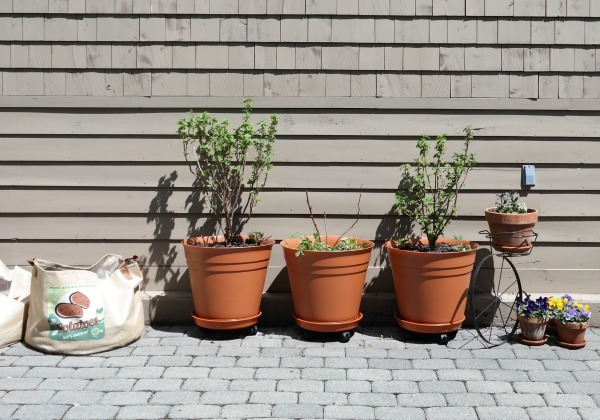 Depending on your zone, some may need to be put in an unheated garage to overwinter, once they go dormant. Like my baby fig tree. I'm praying it will wake up soon and grow up big and strong like the one in the photo. Generally, if your plant is hardy to TWO zones below what your growing zone is, it will do fine outdoors all winter in a large container. However, since we are at the cold end of zone 5A, it's tough to find anything that will survive in a container through our harsh Northeastern winters. And weeds. Weeds would survive a nuclear attack, I'm convinced. So, if I want to grow fruit at my new home, my options are to either dig a big hole in the ground, or buy a big pot and be prepared to move it into the garage in the winter. Our ground is so full of enormous rocks I will gladly move a large pot into the garage for the winter! It's miles easier than digging a giant hole on this mountain top. So, the new berry plants got planted in large containers this weekend. From left to right, there's a black currant, raspberry, and red currant. They will live out on the stone patio for the summer, where they should be quite content. I have them all on wheeled saucers that will make it easier to move them into the garage for the winter. There's plenty of sun on the patio, and they are protected from high winds, right next to the garage wall. I planted the strawberries around the base of the berry shrubs. I'm not sure how that will work out, it's an experiment. Stay tuned. I might have to move them as the shrubs fill in. I'm also hoping the bear will stay away. He can help himself all he wants to the wild berry brambles at the edge of the property. Just stay away from my patio. 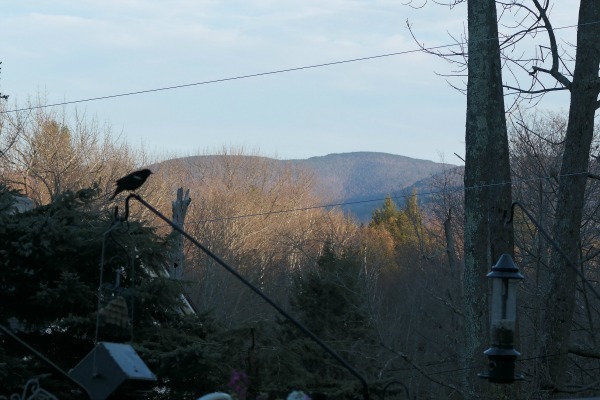 I also pray that the birds will let me have a few berries and not eat them all. After all, I do treat them well. 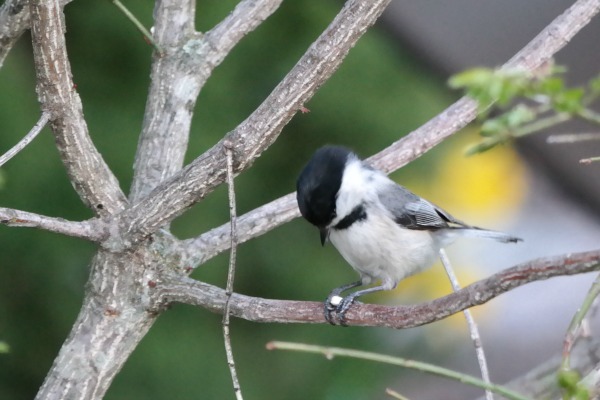 Look at that little chickadee eating a safflower seed. They are so spoiled, my critters! 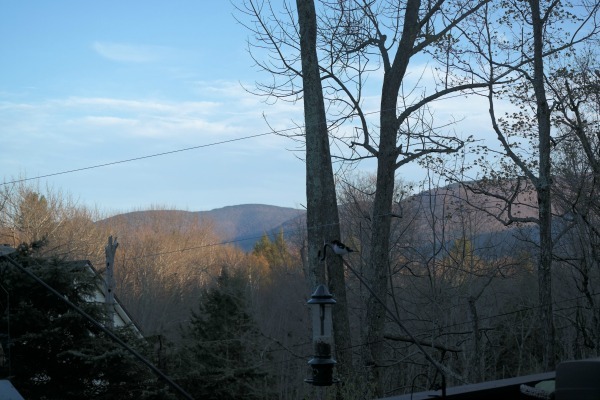 On another note, the mountains were so gorgeous yesterday evening when I was outside grilling I had to take some photos to share with all of you. 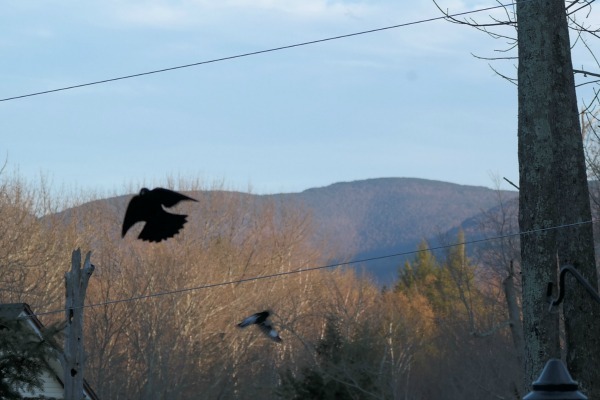 While taking photos of the mountains I caught two birds, one coming in for landing, one leaving. I never get tired of that view. It will shrink soon, when the trees fill in. But I know it will be there waiting for me when the fall comes and the leaves are gone once more. And hopefully by then I'll have a freezer full of berries. I sure hope so, Susie! It will be nice to save some money on the grocery bills!! Oh I can't wait to see what all you plant. I'd love some fruit in containers here. Oklahoma weather has been so extreme the last few years it's difficult for anything to grow. I think weather across the globe has been bizarre - you are not alone, Valerie! I'd love to be able to pick blueberries for my morning cereal. They're expensive in the stores! 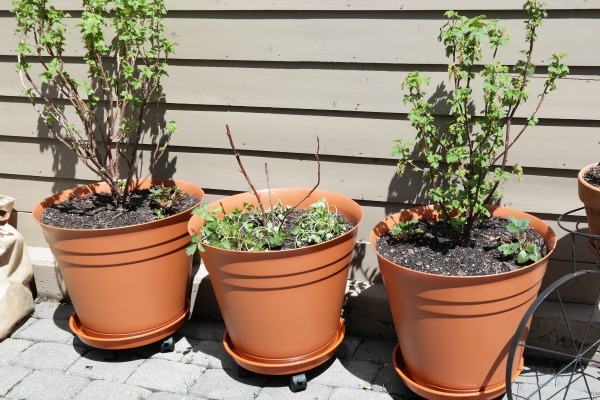 You can definitely grow a blueberry bush in a container on your patio! I would love to step out our door and pick berries, lemons, limes and even oranges; but we have the same issue you do, Debbie. Cold, as in very cold in the winter! When we wintered in Florida for 7-8 years, it was so great to have the best oranges and strawberries. I swear, Florida has the best berries if you get them in season, which is in February! Sweet and juicy, just like I love! I bet you miss all the fresh fruit you had at your fingertips in Florida, Carol! My garage is not heated, but it's definitely better insulated than my little garden cottage. It helps protect the plants, for sure! I wish I had half of your ambition. With your green thumb I'll bet you'll have plenty of fruit. I am the crazy gardening lady who is outside every morning in her purple fuzzy bathrobe and green garden shoes....this is why I have to have a house with privacy! Otherwise they'd come and take me away!! Thanks, Kim - in your zone you should be able to do fruit in pots, for sure. Not citrus....unless you brought it inside by those gorgeous kitchen windows of yours in the winter! We used to have some mature fig trees from Italy. Heres a hint. 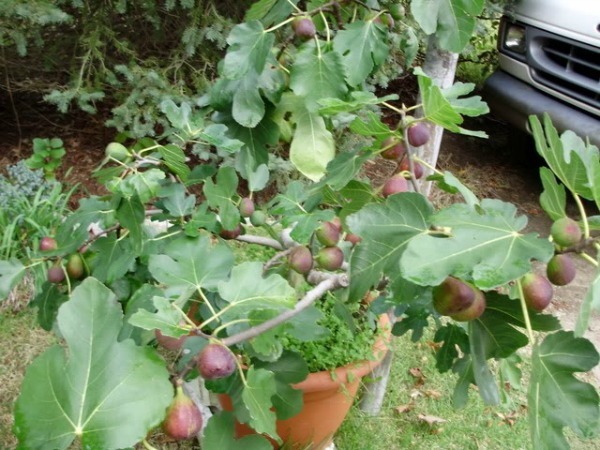 You have to have a female and a male fig tree for it to produce correctly. You will have to google that though as I dont know how to tell the difference. ha. I always enjoy looking through your post at the beautiful photos you share. I am always amazed at how well berries grow in the wild up in the mountains, and yet I have the hardest time growing them in NJ. I would love to be able to grow fruit in containers so I will be following along to see how it goes for you. I never tire of seeing your gorgeous view. Isn't it crazy, Courtney? I have berry brambles everywhere on my property. However, many of them are in a ravine and I can't really get to them. That's ok, those are the ones that the critters can have! I'm hoping the Ponderosa Lemon my husband bought when we moved here will give us lemons. It is now loaded with teeny green globes. What I really would like is a Meyer lemon tree. 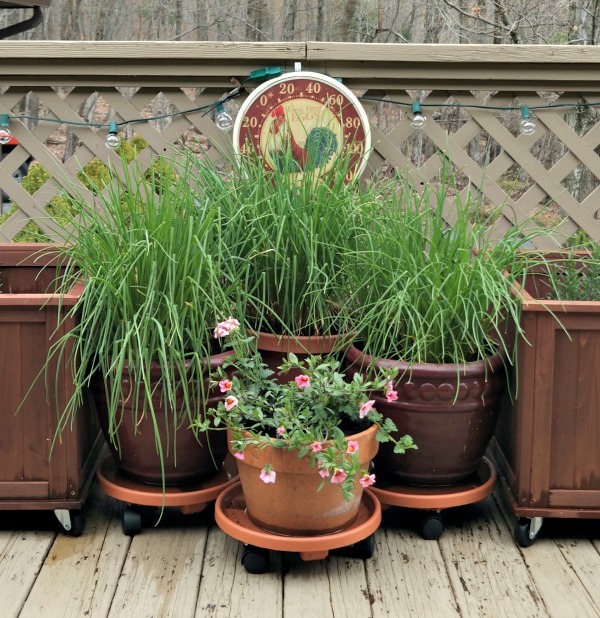 What are the 3 pots of green grass like plants in your 3rd picture? It is just like a pot here that my daughter said were chives but chives aren't flat, are they? At least mine have never been. I love Meyer Lemons - that would be amazing! Those pots of green grass are chives. They may look flat in the photo but they are round! How wonderful to grow your own berries. I'm sure they'll do fine in containers, I'm convinced nearly everything can be container-grown. I just hope the bear and the birds leave you some! Thank you for visiting with us on The Maple Hill Hop! Someday I may add some fruit trees to my yard as well! I adore figs, and we used to have a fig tree in our yard as a youngin'. I remember we had to wrap it every year before winter settled in. I thought it looked ugly, but it worked! I am not nearly as motivated as you are, but I wouldn't mind having a lemon tree. Maybe someday if I ever end up living in a warmer climate ;). Absolutely! Although, they won't produce all season long...I don't think, unless you get a special variety. They sell special varieties that are also better suited to containers. 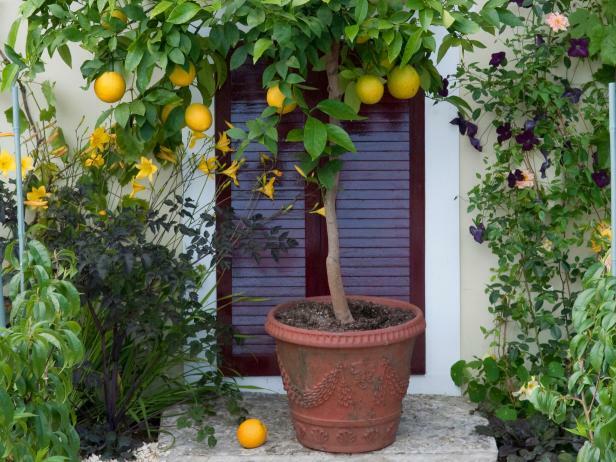 In Italy, where they love their lemons, they have a special room on the bottom floor with a large window (or windows) facing south, just for their citrus trees to over-winter! They actually call it a limonea - or something like that! I have a Meyer lemon and a Tango Mandarin that we keep in very large pots, and they over-wintered just fine in an unheated greenhouse where I put plastic jugs of water, to help moderate the inside temperature. Once our new house is built, I will have a small greenhouse attached to the front (south) side of the house, which will probably end up as a permanent place for the citrus. The only problem with the large containers is that those suckers are heavy! That's what I'd love - a greenhouse attached to the house where I could keep citrus and other tropicals. Someday, please God! You are a walking encyclopedia (took me a minute to remember how to spell one with out spell check) of information. I thank you for sharing your great ideas with everyone and being so free to give out information. Thanks for sharing and linking. Hardly an encyclopedia!! Glad you enjoyed it! You are a wonderful source of information for us all! I live in the Rio Grande Valley of South Texas where citrus is a major crop. Each of our areas has its own special attraction. How nice - not here in upstate NY, that's for sure! Your view is incredible and so inspiring I can certainly see why you never tire of it. Gardening is challenging, isn't it...here we have that wretched heat that arrives like a blast from a hot oven and such poor soil. You have cold and yes weeds, I could have a bumper crop of them! I don't think my pale freckly skin would do well in your climate at all!! Best for golden sun goddesses such as your gorgeous self! Now I want to grow a lemon tree and some grapes in a container.